The script halshow can help you find your way around a running HAL. This is a very specialized system and it must connect to a working HAL. It cannot run standalone because it relies on the ability of HAL to report what it knows of itself through the halcmd interface library. It is discovery based. Each time halshow runs with a different LinuxCNC configuration it will be different. As we will soon see, this ability of HAL to document itself is one key to making an effective CNC system. Halshow is in the AXIS menu under Machine/Show HAL Configuration. Halshow is in the TkLinuxCNC menu under Scripts/HAL Show. At the left of its display as shown in figure is a tree view, somewhat like you might see with some file browsers. At the right is a tabbed notebook with tabs for show and watch. The tree shows all of the major parts of a HAL. In front of each is a small plus (+) or minus (-) sign in a box. Clicking the plus will expand that tree node to display what is under it. If that box shows a minus sign, clicking it will collapse that section of the tree. Clicking on the node name, the word "Components" for example, will show you (under the "Show" tab) all that HAL knows about the contents of that node. Figure [cap:halshow-layout] shows a list exactly like you will see if you click the "Components" name while you are running a standard m5i20 servo card. The information display is exactly like those shown in traditional text based HAL analysis tools. The advantage here is that we have mouse click access, access that can be as broad or as focused as you need. The second pin’s name contains the complete name of the first. Below the show area on the right is a set of widgets that will allow you to play with the running HAL. The commands you enter here and the effect that they have on the running HAL are not saved. They will persist as long as LinuxCNC remains up but are gone as soon as LinuxCNC is. This little editor will enter a command any time you press <enter> or push the execute button. An error message from halcmd will show below this entry widget when these commands are not properly formed. If you are not certain how to set up a proper command you’ll need to read again the documentation on halcmd and the specific modules that you are working with. Now look at the components node and you should see ddt in there someplace. This is just for viewing, so we leave position blank and get the last position in the thread. 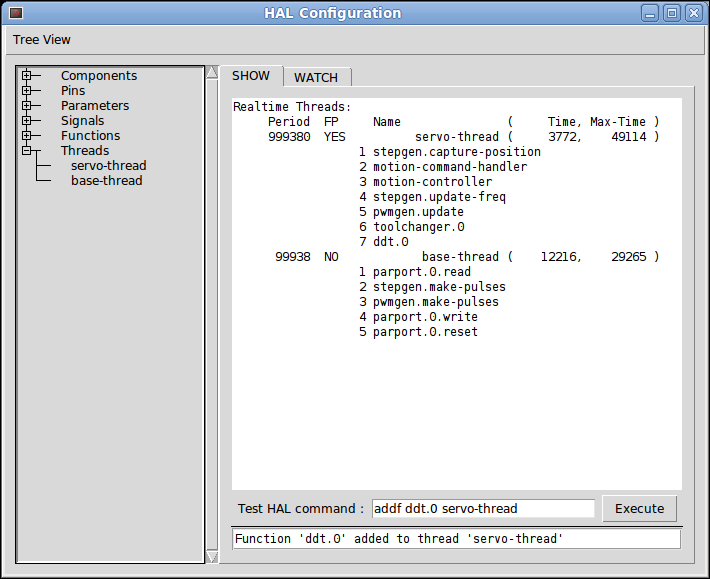 The following figure shows the state of halshow after this command has been issued. We see that this signal comes from axis.o.motor-pos-cmd and goes to both ddt.0.in and stepgen.0.position-cmd. By connecting our block to the signal we have avoided any complications with the normal flow of this motion command. 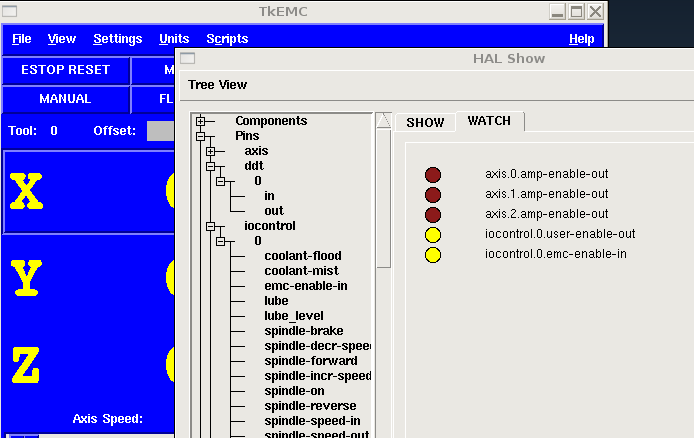 The HAL Show Area uses halcmd to discover what is happening in a running HAL. It gives you complete information about what it has discovered. 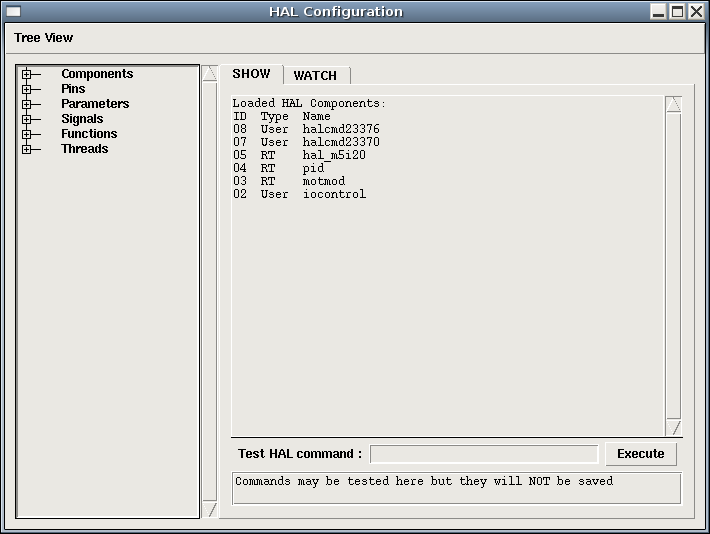 It also updates as you issue commands from the little editor panel to modify that HAL. There are times when you want a different set of things displayed without all of the information available in this area. That is where the HAL Watch Area is of value. Clicking the watch tab produces a blank canvas. You can add signals and pins to this canvas and watch their values. You can add signals or pins when the watch tab is displayed by clicking on the name of it. The following figure shows this canvas with several "bit" type signals. These signals include enable-out for the first three axes and two of the three iocontrol "estop" signals. Notice that the axes are not enabled even though the estop signals say that LinuxCNC is not in estop. A quick look at TkLinuxCNC shows that the condition of LinuxCNC is ESTOP RESET. The amp enables do not turn true until the machine has been turned on. Watch displays bit type (binary) values using colored circles representing LEDs. They show as dark brown when a bit signal or pin is false, and as light yellow whenever that signal is true. If you select a pin or signal that is not a bit type (binary) signal, watch will show it as a numerical value. Watch will quickly allow you to test switches or see the effect of changes that you make to LinuxCNC while using the graphical interface. Watch’s refresh rate is a bit slow to see stepper pulses, but you can use it for these if you move an axis very slowly or in very small increments of distance. 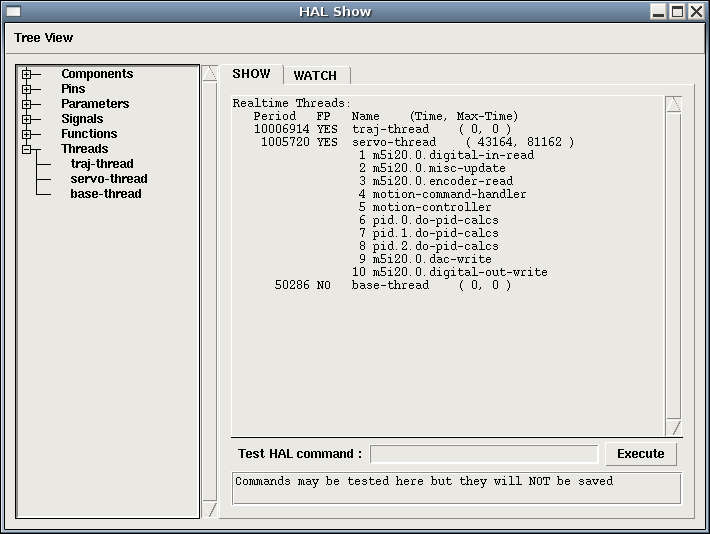 If you’ve used IO_Show in LinuxCNC, the watch page in halshow can be set up to watch a parport much as IO_Show did.